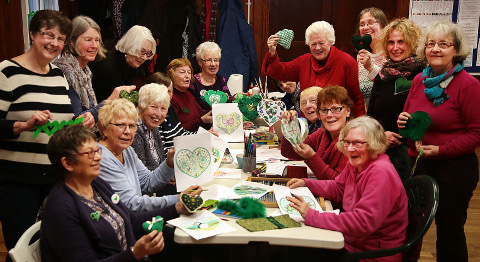 Every February, WI members turn Valentine's Day green by making, wearing and sharing green hearts to show their commitment to tackling climate change. 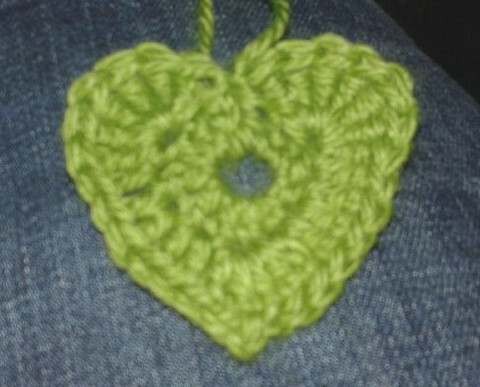 Sir Gâr/Carmartheshire Federation organised a green hearts craft workshop for members. 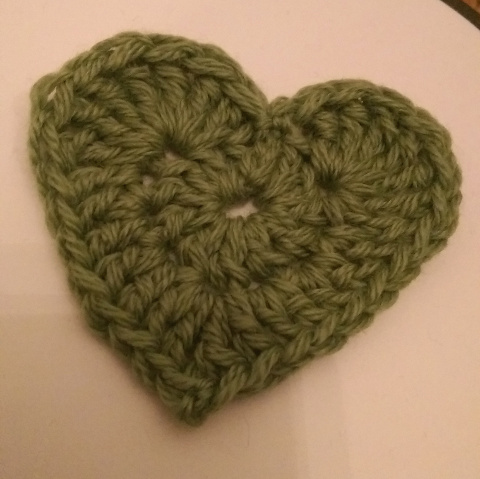 Armed with a variety of textiles, paint, knitting needles and crochet hooks members made a variety of green hearts, most of which were being given out to fellow members at their February WI meetings. 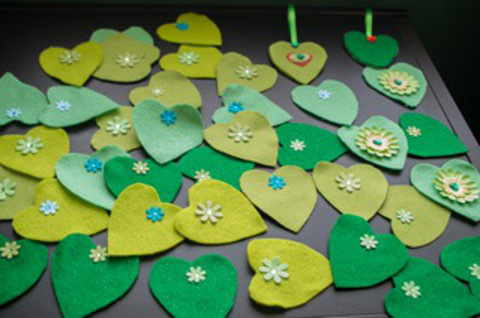 Workshops and discussion also took place in Ceredigion Federation and Narberth WI in Pembrokeshire made green hearts for display in local shops. 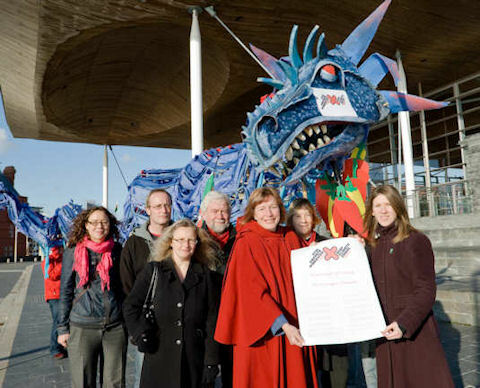 NFWI-Wales is a member of Stop Climate Chaos (SCC) Cymru, a coalition of civil society organisations which is working to mobilise public concern, and through this the necessary political action, to stop climate chaos. Following on from the COP21 climate conference in Paris, SCC Cymru and the Welsh Centre for International Affairs organised the Good COP? Bad COP? 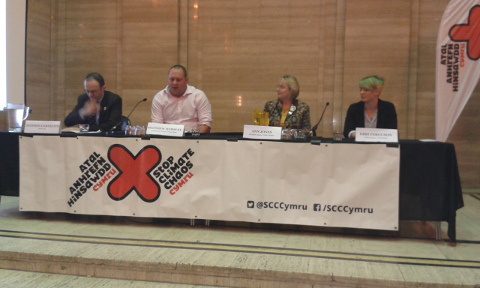 event in Cardiff to both reflect on the climate talks and to discuss the way forward. Three panels of expert speakers presented their views on the outcome of the talks and discussed what COP means for Wales, the UK and the World. NFWI-Wales Chair Ann Jones took part in the UK panel. Ann shared WI members' concerns about climate change and highlighted the unique role of women in tackling climate change as guardians of natural resources, primary decision-makers in household consumption, educators of the next generation and key voices within communities. Speaking about the outcome of the COP21 climate talks in Paris, Ann said that that landmark deal, signed by representatives from almost 200 countries, represented a change in thinking and gave us hope. However she stressed that the deal was by no means a final solution and it was important to keep up the pressure to ensure that the deal becomes more than just words. Find out more about the debate. 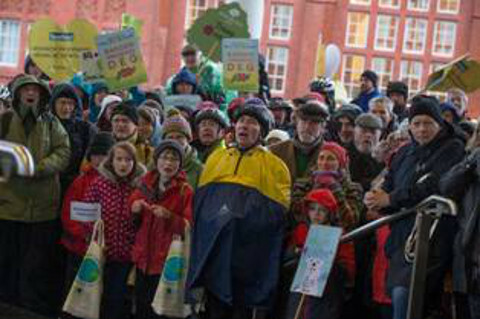 Ahead of the COP21 conference, hundreds of people from across Wales joined SCC Cymru in Cardiff on 28 November 2015 to call for stronger action on climate change in Wales and for decision-makers at the UN talks to reach a fair, global deal on action to tackle climate change. 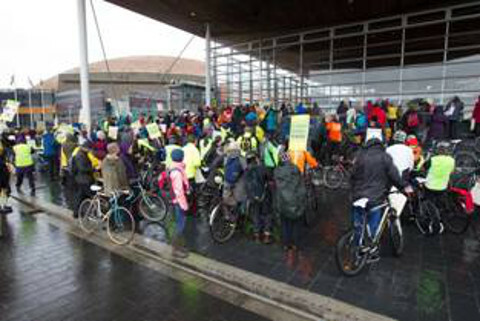 A mass bike ride took place from the city centre to the Senedd in Cardiff Bay. This was followed by a rally on the steps of the Senedd where entertainment was provided and supporters were addressed by representatives from civil society and cross-party representatives. Stop Climate Chaos Cymru held an event on the steps on the Senedd on 14 July (Bastille Day) which saw Assembly Members from all political parties sign up to strong commitments on climate change. 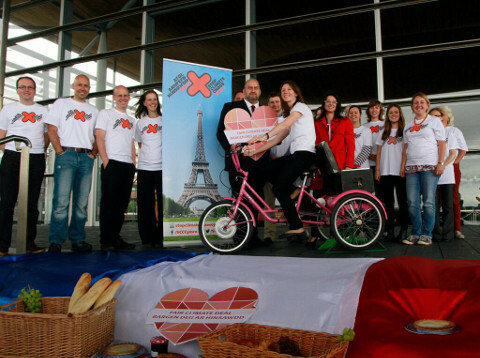 A French-themed picnic was organised for SCC Cymru members and Assembly Members cycled on a stationery pedal powered bike as part of a photo opportunity depicting the road to Paris for the climate talks in December. 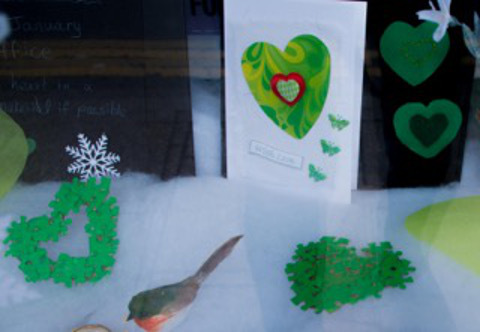 The For the Love of…… campaign highlights that everyone loves something that is threatened by climate change and that action must be taken to protect what we love. 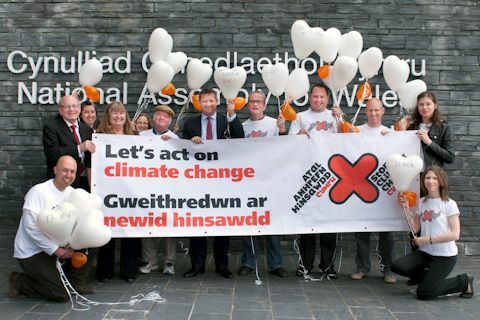 On 30 April 2014, Assembly Members showed their commitment for action on climate change by joining SCC coalition members at the Welsh launch of the For the Love of....... campaign on the steps of the Senedd. 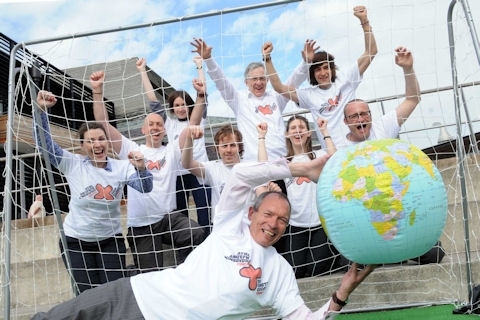 As John Griffiths AM, Minister for the Environment and Sustainable Development left for Brazil on 15 June 2012, Stop Climate Chaos Cymru gave him a sporting send off to go and help save the world at the UN Rio+20 global Sustainable Development Summit. As part of the UK Delegation, John Griffiths highlighted the advances and leadership that Wales is showing in Sustainable Development, from specific policy actions such as the Arbed home energy efficiency scheme to the forthcoming Sustainable Development Bill. 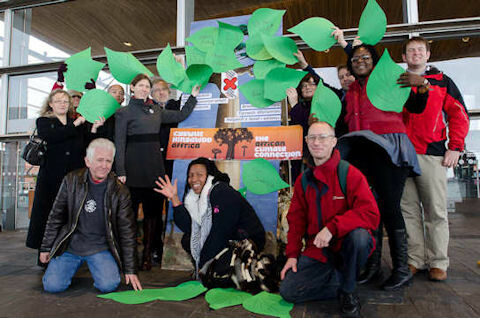 On 27 November 2011 supporters of Stop Climate Chaos Cymru, along with African musicians, staged an African Climate Connection linking Wales and the International Summit in Durban. The Environment Minister for Wales and Members of the National Assembly for Wales from all four parties braved the blustery weather to join members of Stop Climate Chaos Cymru outside the Senedd building in Cardiff Bay. 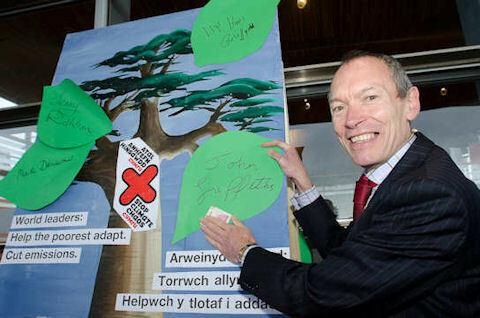 They pledged their support for a global emissions reduction deal and funding to help the poorest countries adapt to climate change by signing symbolic 'leaves' to add to an eight-foot-tall Baobab tree with the message from Wales to world leaders. Zimbabwean drummers created an African atmosphere. On 30 March 2011, the report Cutting Carbon, Creating Jobs was launched. The report commissioned by Stop Climate Chaos Cymru and based on research by Dr Calvin Jones of Cardiff Business School, Cardiff University, offers practical measures for the Welsh Assembly Government to tackle climate change and boost employment. The report focuses on three key areas that provide cost-effective ways of cutting carbon, creating jobs and improving health. * investing in green skills. Read the executive summary and full report on the SCC Cymru website. 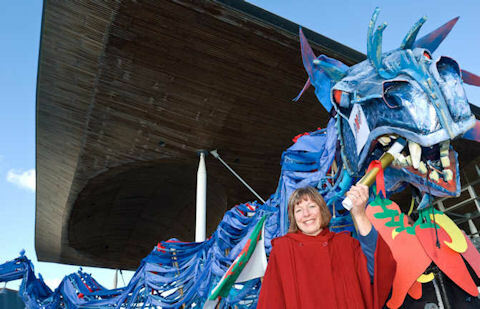 In advance of the UN climate change summit in Cancun from 29 November to 10 December 2010, Dai the Dragon presented a scroll engraved with a series of requests from SCC Cymru to Jane Davidson AM, Minister for Environment, Sustainability and Housing, at the Senedd on 25 November 2010.